I’ve been sick the better part of the last two weeks so our adventures have been limited. 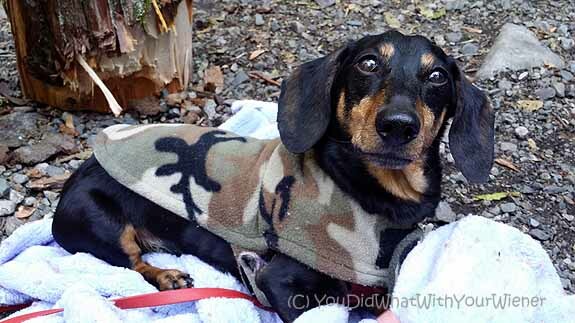 We were able to make it to the annual Adventureweiner Club camping trip that I organize though. While the fun wasn’t WITH water, were were camping by it. 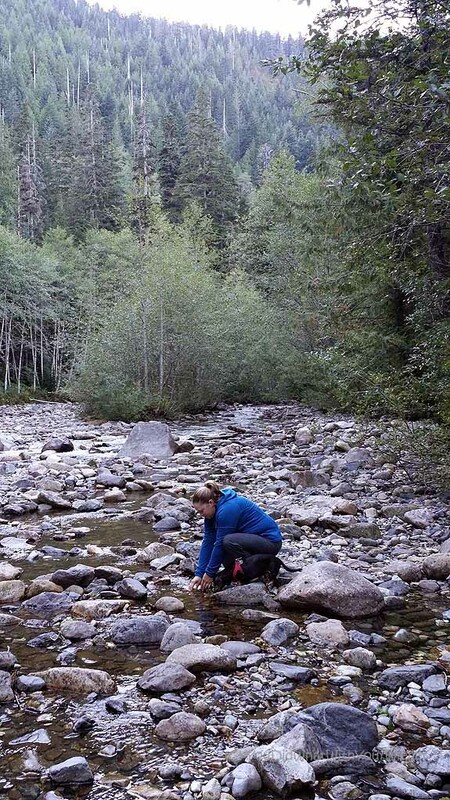 We stayed at the Denny Creek campground near Snoqualmie Pass. Unlike last year when a lot of mistakes were made and lessons were learned, the trip this year went off without a hitch and was really pleasant. Between the 4 of us we had 8 dachshunds so, as you can imagine, it was quite a riot. Our friend Winston came and we loaned him one of our doggy life jackets so his doggy daddy can take him paddleboarding next weekend. It was a short overnight car camping trip so there was a lot of hanging around camp…….. Although car camping was fun, It’s kind of tame for us. I can’t wait to go on a bigger adventure soon. This is part of the Adventure Dog Blog Hop hosted by yours truly, DOGthusiast and Tiffany’s Diamond Dogs. Clicking the little thumbnails down below will transport you to other doggy adventures. Don’t forget to join us on Twitter on Wednesday 9/17 at 5 pm PST/8 pm PST for #AdventureDogChat. That looks like a blast lol! 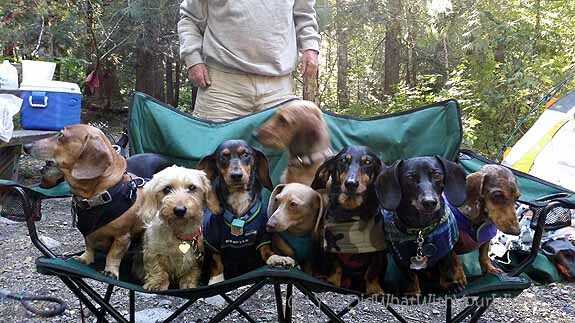 9 wiener dogs all at once… I don’t go camping much anymore so I’m behind on my camping terminology. Does car camping just mean you sleep in your cars? Car camping as opposed to back packing. It means your gear is hauled in your car and you set up camp near the car. You don’t normally sleep in the car. What a cute picture with all of them. Looks like a great fun time. Ohh! Camping! Did you eat a smore (minus the chocolate of course?) 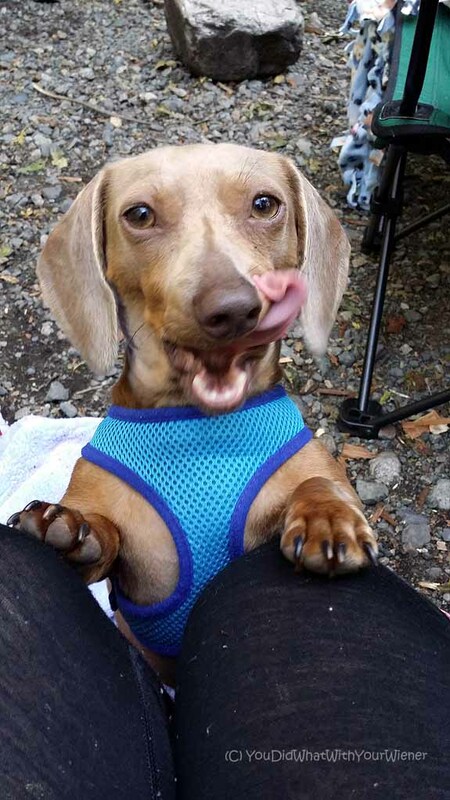 or cook a wiener….errr….hot dog over the fire? BOL! Good lord you had your hands full! looks like a real blast would love to do something like this in Australia with my boy, he’d have an awesome time because he loves socialising with other dogs especially other dachies. where did you get your doggie life vests from? Life vests? You mean the ones Chester and Gretel wear on the paddleboards? Cute little coats you have and love that wiener pile in the one photo! I’m amazed that you got 8 of them to sit still long enough for that photo. Adorable. Looks like you had a blast! We are planning some backpacking trips! Can’t wait! 9 wiener dogs! Sounds like a handful! I can’t even imagine packing for a trip like that! What a nice way to spend time with your dogs. I am sure they loved it! Wow! nice recreation. That’s a beautiful place too. Love the pics and of course the adorable pups. I love hiking with my friends up here in the beautiful Colorado Mountains but I was always having to pack extra rope. It was heavy and it would get all tangled I hated having to carry it around so one day I was stupid and just didn’t bring it. I was hiking alone with my dog on a beautiful summer day when my dog spotted a rabbit and pulled her leash out of my hands down a steep muddy sloop she went. I yelled for her to come and being the good dog she is she was ran to the bottom for the sloop. I called again but she just looked at me like you think I’m going up that? But after a few more “come girl” she tried it anyways. I have a 80 lb. pitbull she’s strong as hell but she could not get up the slope. She tried and tried tell she was beat and just laid there. I couldn’t go down the hill or we could have both been stuck. I told her to stay and I looked for another way to go down and get her but there was no way for her to get back up. I ran back to her she was still there just looking at me for help. Thats when my life changed a man and his dog came around the conner I yelled “help” he came running over to see what was wrong seeing my dog he actually began to laugh. Tell he saw I was in tears he stopped and looked at me and said “do you have any rope” I said “no” so he looked at his dog and told him to sit he took off his dogs collar and started to unwrap it. It became 30 feet of rope in less than 10 min I was in shock he tied it to a near by tree and told me to climb down. I climbed down tied my dog to the rope and he was able to give her that pull to help her up the hill than it was my turn it held my 150 lbs of weight not problem. Once we were safe I thanked him and asked where I could get something like that he gave me a website and I bought a bracelet a dog collar and a keychain I don’t bring rope on my hikes anymore I bring my PARACORD!!!! We’re about to take the little dogs camping and I’m a bit nervous since they aren’t really outdoor dogs. 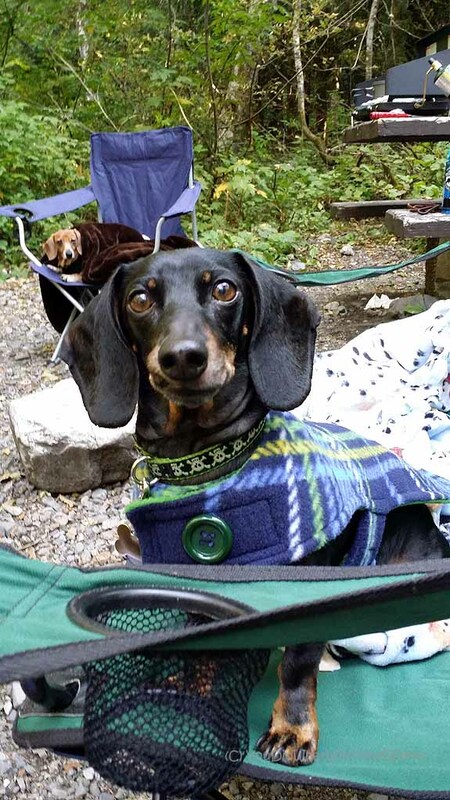 This post makes me confident that smaller dogs can enjoy camping too!